The end of an era, The end of the series and the end of a series of unfortunate events. The book begins with the children having just jumped off the roof of the hotel in the boat with count Olaf and having landed in the sea. The three children and Olaf drift off to sea not knowing where there going to end up and not knowing what has happened to everyone back at the hotel. One night a terrible storm hits and causes massive trouble with the boat. When the storm is finally over the children find they have washed up on to a coastal shelf. When looking around they find that Olaf has also been washed onto the coastal shelf. They decide there must be an island nearby and go in search of one however, before they get to far they see someone coming up the sand towards them. A young girl named Friday. It turns out the island has a whole community of people living on it. 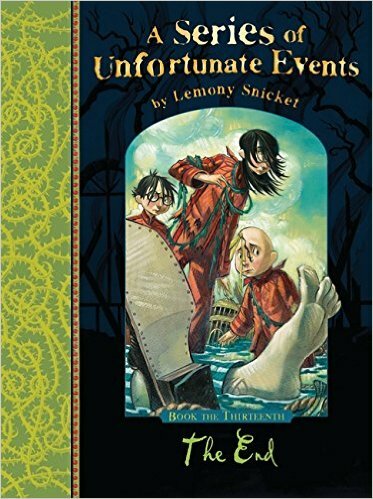 They welcome the Baudelaire's into their community and shun Count Olaf because he was rude and unkind. The Baudelaire's soon learn this community has rules and secrets of its own and soon the Baudelaire's become suspicious. Have the Baudelaire's finally found a safe place to live? Has Olaf really left them alone? What secrets does this community have to hide? I was really disappointed with this book. To be honest i didn't really see the point in it. None of the questions left from the previous books were answered, The story didn't really seem to have a point or a meaning to it. Without giving away any spoilers the end of the book with Olaf and Kit was just confusing and all in all i can say i think it just was nowhere near as good as the previous twelve books. I even went as far as to only give this book a 2* review on goodreads. It made me feel that in the end the whole story was leading up to nothing, i feel like i have been lead on through twelve books only to be dropped at the thirteenth book. Very disappointing indeed. Oh well... Onto find my next read. So far i have read thirteen books in thirteen days so lets continue shall we.